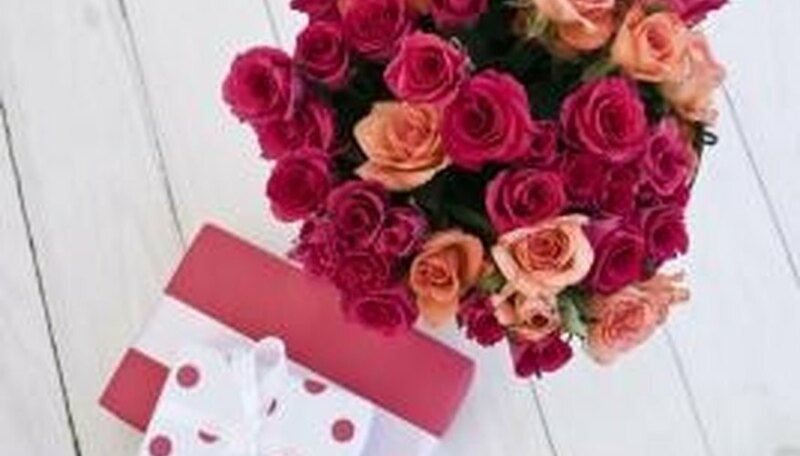 Do Roses Last Longer in Sugar or Aspirin? Why Does Aspirin Preserve Cut Flowers? Fill a flower vase with water. Leave a little room at the top, but in general you want your vase to be at least three-fourths full. Add a bacterial inhibitor to the water in the vase, such as bleach, a copper penny, or vodka. You only need to choose one of these--1/4 tsp. bleach, one copper penny or three drops of vodka is enough to stop bacteria from killing your flowers. Add a food source to the water in your vase. You can either use 3 tbsp. of sugar or 1/4 cup of soda. Use a pair of garden scissors to cut your flower from its plant. Make sure you cut the stem at an angle so that the flower has the best chance of absorbing the food and water from the vase. Place your flowers in the vase immediately after you have cut them. Place your flowers in a cool spot. According to Teleflora, flowers prefer temperatures of 65 to 72 degrees Fahrenheit. Adding a couple of teaspoons to the water in a vase of roses can help them remain fresh longer. The carbohydrates in the sugar feed the stems to encourage flowers to stay healthy looking for longer periods of time. This can help roses stay fresh for 2 to 3 more days. For many years, adding 1 uncoated aspirin to the vase water of roses was believed to help keep them looking fresh longer. However, now it is not as commonly done and this practice is considered to actually be an old wive's tale. These days, it is believed that aspirin has little to no effect at all on how long cut roses stay fresh. However, florists still recommend adding sugar to fresh vase water that is changed every couple of days to extend the freshness of cut roses. Cut flowers for your vase with gardening scissors. Make sure that you cut the flowers at an angle, not straight across. Place one quart of water in your flower vase. Cut a lemon and squeeze out the juice. Use 2 tbsp. of that fresh juice in the water in your flower vase. Add 1 tbsp. of sugar and 1/2 tsp. of bleach to the flower vase and stir. Place your cut flowers in the vase. If you see any leaves submerged in the water, remove them. Go out to your garden early in the morning, while the flowers are still wet from the dew. If you do not make it to the garden in the morning, go in the early evening when the air has cooled. Look at the flower stem; find an area on the stem that is just above a node, which is the spot from which a bud could sprout. If there is no chance of another bloom, as in single stalk flowers like daffodils, move on to the next step. Take the shears and cut the flower stem with a diagonal slant.The Brooklyn Botanic Garden recommends an angle of approximately 45 degrees. If you are not looking for another bloom on the stalk, cut the flower 1 inch up from the bottom of the stem. Place the flowers in the bucket of lukewarm water as you cut them, as this will keep them fresh until you are ready to take display them in a vase indoors. Set your cut flowers in the refrigerator for six hours. While the flowers are in the refrigerator, move on to step 2. Place 6 inches of cold water in a vase. Add your bactericides if you purchased the cut flowers from a flower shop. Bactericides come in a little packet from most flower shops now. They keep your flowers from wilting due to bacteria or fungi. You can buy them for your home use as well. 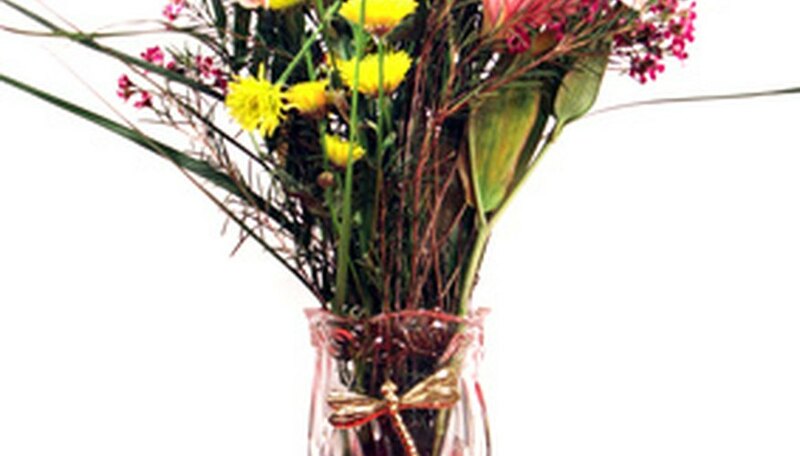 Set your flowers in the vase and remove any leaves that are below the water line. Commercial preservatives are a mixture of sucrose (sugar), acidifier, a microorganism inhibitor and a respiratory inhibitor, according to the University of Minnesota Extension. Before adding the preservative to the water, clean your container well to get rid of any debris or leftover soap. Make your own preservative by mixing 1 part lemon-lime soda with 3 parts water. Do not use diet soda. According to the Master Gardeners Santa Clara County, also adding 1/4 tsp. of household bleach per quart will help keep the water clear. If you don't have soda handy, add 2 tbsp. lemon juice, 1 tbsp. sugar and 1/4 tsp. bleach per quart of water. Freshen the water every four days by adding another 1/4 tsp. of lemon juice. Never put aspirin or vinegar in your flowers' water. According to the UM Extension, lengthen the life of your flowers by adding water, as needed, every day to your container, keeping the container away from drafts or hot spots, such as radiators or television sets, placing your container in a refrigerator or the coldest spot in the house while you are gone, and keeping apples or bananas away from your flowers. Fruit can emit gases that rapidly age your flowers. Use clean disinfected tools when cutting flowers. Only place flowers in clean disinfected vases. Add a flower preservative, available from florists, to the water in the vase or make your own by combining one part lemon-lime soda to three parts water. Place flowers in cold water rather than warm, which tends to dry out flowers. Set freshly cut flowers in the refrigerator for six hours to extend their lives before placing at room temperature. Cut stems daily at a 45-degree angle under running water to open up the stem for more water penetration. Remove dying leaves and foliage daily under the water line. Crush an aspirin. Place the aspirin in a spoon and place another spoon on top. Squeeze the spoons together to crush the aspirin. Mix the aspirin into a vase full of water, and place the flowers in it. Trim off a bit of the stems each day to keep the flowers drinking. The stems seal themselves up over time, which keeps them from getting the water they need to stay fresh.